Today’s look at Dallas history focuses on the corner of Houston Street and Young Street. 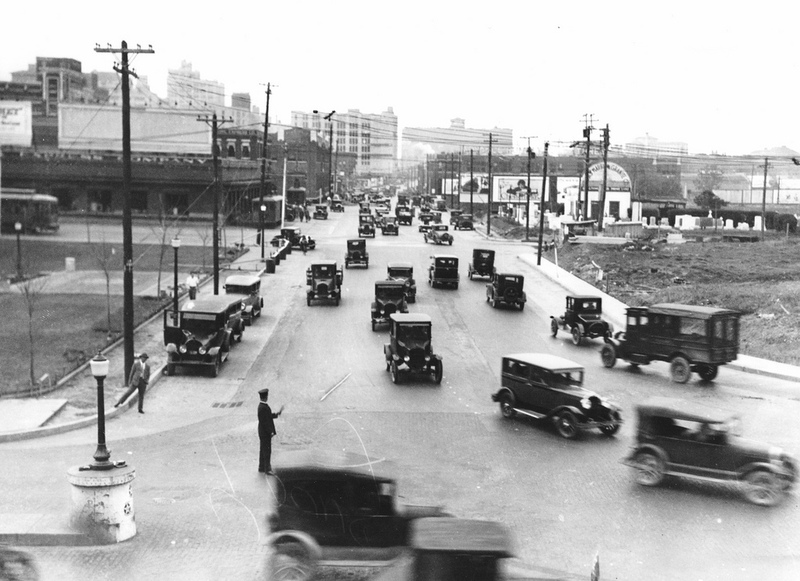 This photograph — taken in the late 1920s — shows daily traffic heading to and from the Oak Cliff Viaduct (now known as the Houston Street Viaduct, which just celebrated its 100th birthday). The view looks east on Young Street from the south side of Union Station. The photo shows several recently-completed structures in the background. On the north side of Young Street (left side) is Ferris Plaza, opened in 1925. The park was built to serve as a dramatic entry into Dallas for visitors arriving via train at Union Station. Seen on the east side of Ferris Plaza was located the freight depot for Texas Electric Railway — serving cities across the region with interurban express passenger and freight service (click here for an alternate view of the depot). In the distance the Santa Fe Warehouse (completed in 1926) can be spotted. Later, the Dallas Morning News (also designed by George Dahl) would build its headquarters in the empty lot on the right; civic and convention facilities would eventually creep this way. Before the Mixmaster and the network of divided highways, tollways and interstates, this intersection was one of the busiest in town. For many years, traffic going to and from Fort Worth and Waco traveled the Oak Cliff Viaduct over the Trinity River to reach downtown Dallas and beyond. In the photo, star medallions can be seen under the lamppost indicating the many Texas highway routes. Continuing north on Houston Street would take visitors to the heart of downtown, while a route up Young Street would bypass the commercial center. Today the intersection of Young and Houston remains a busy route, although both have been converted to one-way traffic. Young now extends west toward the Reunion District. Check out a current view from this location. A larger image of this historic photo with more details can be seen here. One Response to "1920s Traffic at Houston & Young Streets"
I LOVE these old photographs. As a Native Texan… I think ANYTHING Texas is cool.